30.10.17 Cardinal Pole School Library, Hackney, completes. The new Library at Cardinal Pole School is complete and now awaits books and students. The building is a cross-laminated timber (CLT) structure with external copper-coloured perforated metal cladding. It is connected to the existing school buildings (by Jestico and Whiles) by a glazed bridge following the lines of the existing building with its main circulation route running seamlessly into the new spaces. 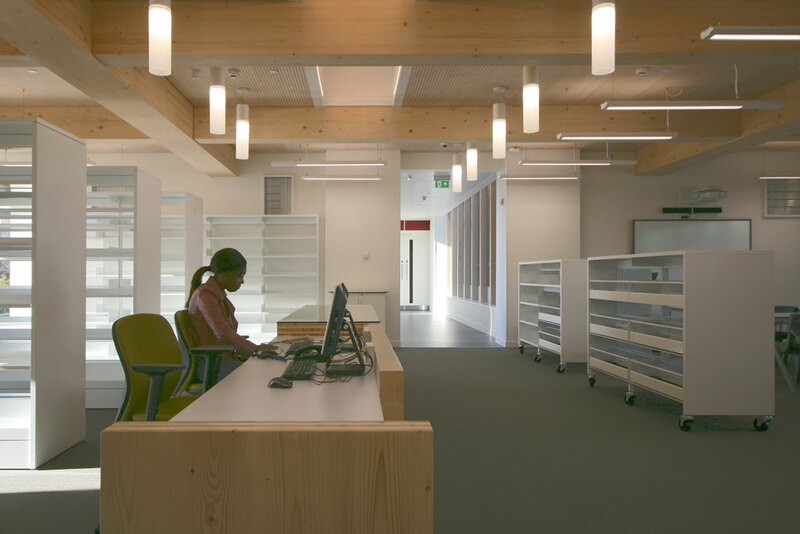 The castored Library shelving can be moved to form different arrangements, with the main control desk – built out of the left-over sections of CLT – sat the centre of the plan under a lightwell.